It was during the 2011 tour to the West Indies that India last won a Test series away from home. 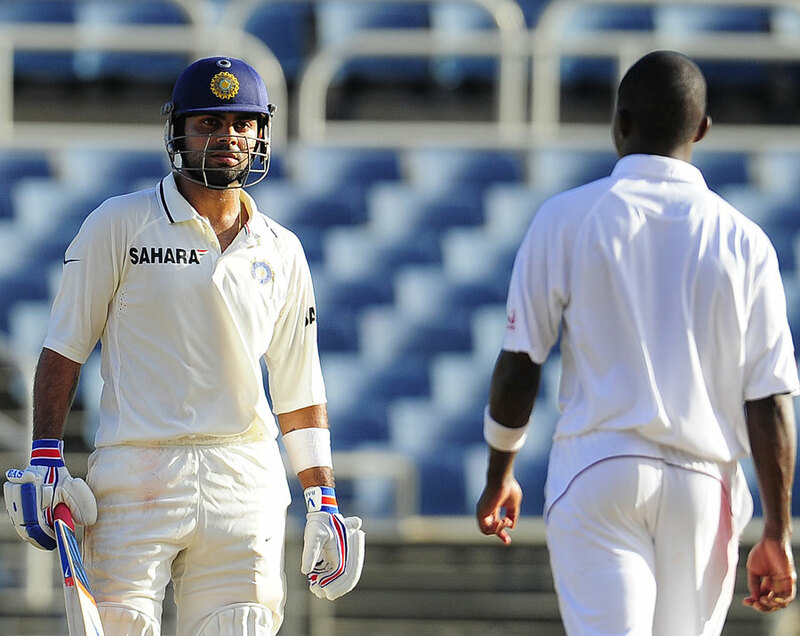 Virat Kohli was on debut in the first Test of the series at Kingston, Jamaica. After making only 4 in his first Test innings, he was in the company of Rahul Dravid in the 2nd innings when the fiery Fidel Edwards decided to test him. A barrage of quick, short deliveries had Kohli hopping around the crease and awkwardly defending. Stares were met with glares. On one delivery, Kohli ducked in to the bouncer and was hit on the forearm causing a buzz in the sparse crowd. On the next delivery, Edwards tested him again with a short one but Kohli got under it easily, and responded with something never before seen on a cricket field—in typical Delhi-ite fashion, he blew kisses to Edwards! Edwards got him with another short delivery the following morning. Kohli would be dropped after the Tests from the squad to England. He managed to collect only 76 runs across five innings, disappointing himself surely, but also a lot of his well-wishers, supporters, and followers of the game who expected a lot more from him. After all, he pushed himself in to the 2011 world cup winning squad on the strength of performances after being dropped. Since the inauspicious and inconspicuous debut, Kohli was brought back in time for the tour to Australia in 2011-12. He warmed to the task by scoring twin fifties against the West Indies at home. He provided the lone batting highlight in a team of stars with his maiden Test hundred at Adelaide, after a fighting 75 at Perth. He hit another century at home against the touring Kiwis and guided the chase in the 4th innings with a serene half century in Bangalore. More away hundreds in South Africa and New Zealand followed in 2013-14 and the Kohli that everyone expected was blossoming into a complete batsman in front of our own eyes. Between June 2011 and December 2014, Kohli transformed himself from a young upstart who led India Under-19 to a world cup to a player that the national team heavily relies on. He had assumed the position vacated by Sachin Tendulkar in the line up and appears to be on his way to do full justice to it. In the One Day arena, Kohli’s record is already astonishing and appears destined to go past Tendulkar’s career collection of 49 centuries. He is just 1 more ton away from being the 4th highest century maker in ODIs, and that at an average exceeding 50. He has played career-defining innings including the assault on Lasith Malinga during a nerveless chase in Hobart and the mindboggling 183 against Pakistan in Dhaka. Winding the clock forward to December 2014, Kohli is in imperious form, recovering from a lean tour of England. He is now seen as the unquestioned leader of the Indian batting unit. He has already amassed 30 international hundreds and just emulated the Indian batting legend Sunil Gavaskar with three hundreds in a series in Australia. His Test average is heading well north of 40 and, seemingly with every outing, he is stamping his class and authority on the game. India are already down 0-2 in the Test series. Despite Kohli’s best efforts with twin centuries in Adelaide, an improbable win looked very possible and within grasp before it was snatched away. At Melbourne, Kohli is playing another one of his regal innings and the Australian bowlers are a bit knackered. Mitchell Johnson throws at the stumps and hits Kohli. There is plenty of chatter around and Kohli is only happy to participate in it. He thinks the banter only helps him do better. He takes a length delivery from Johnson and powerfully smacks it over mid-off. He puts an exclamation mark on the audacious shot with a little kiss blown to the bowler (Link). In Jamaica, he was seen to be just talking the talk without really walking the walk. In Melbourne, he talked the talk and walked the walk. They have called him a spoilt brat. They saw him as too brash. They thought he was just all bling-bling. They have seen him to be a respectful of the game. They have heard him to be a young man wanting to be amongst the greats. We have seen and heard him to be all that and more. He is a kid from Delhi that gives a bit of lip, cops his share and gets on with the game. The game, he has got a lot of it. This entry was posted in Featured, India and tagged Australia, Fidel Edwards, India, Mitchell Johnson, Virat Kohli, West Indies. Bookmark the permalink.